Did you know there are two levels of permissions on your mac? User level and system level. 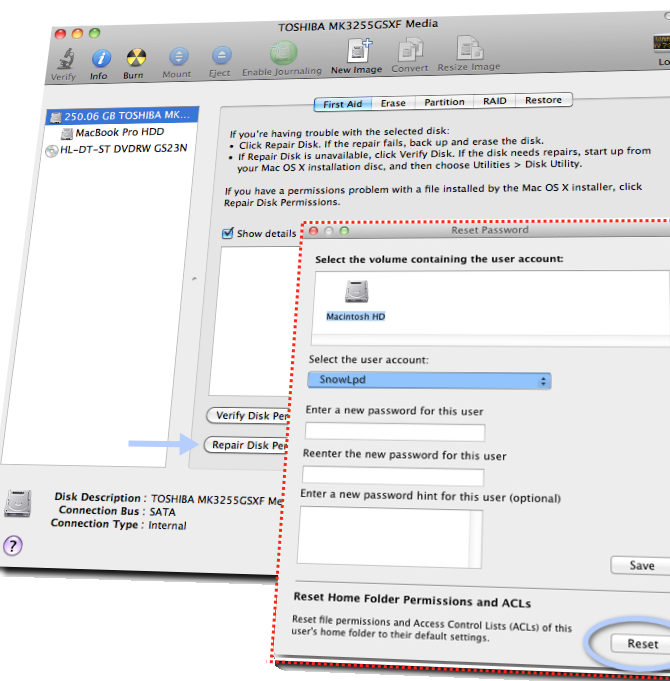 Most discussions of fixing permissions only discuss the latter, but you may also need to fix the former (also sometimes called ‘ACLs’) for some problems caused by upgrading Lion on top of Snow Leopard. You can safely repair your system level permissions at any time, and doing it once in a while is a good maintenance activity even if you’re not experiencing any problems. 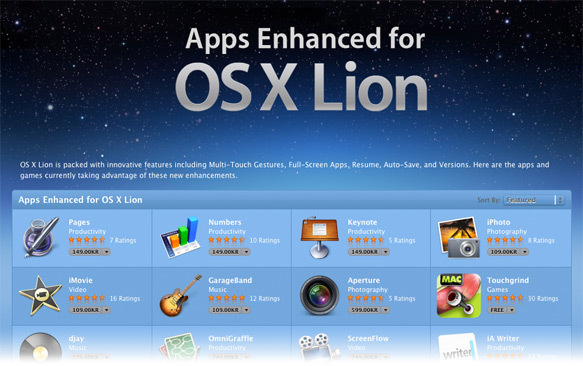 It’s also the first thing to do as soon as you notice any problems with apps launching, file access problems, or your computer seems to be running unusually slow. — 1. Go to Applications > Utilities > Disk Utility.app and double click the app to open it. — 2. Click your HDD icon in the left column (if you have more than one, click the one that contains your startup disk). — 3. If it is not already selected, click on the ‘First Aid’ tab. Choose the ‘Repair Disk Permissions’ button near the bottom of the window (see the larger of the two windows in the screenshot above). — 4. Wait for the process to finish (it could take ten minutes or more), then quit Disk Utility. You can ignore most of the error messages that appear unless they’re in red. These permissions apply only to your ‘Home’ folder and its contents, and if you have more than one user you will need to do this procedure for any user experiencing a problem. However, unlike system level permissions, repairing ACLs isn’t something you should do unless there is a specific issue to be solved. 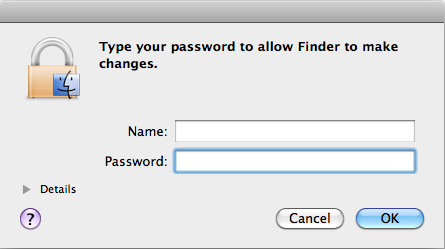 Problems that this repair might help with include permission conflicts inherited from an earlier Snow Leopard or Leopard installation, such as Finder always asking for your password when you try to delete, move or copy a file. and press return. Enter your password again if necessary. — 4. Forget about resetting your password; what you’re looking for is your hard disk icon at the top. Hit that, and then from the drop-down menu select your user account. — 5. Go to the bottom of the dialogue window – leaving all password fields blank – and choose ‘Reset’ under ‘Reset Home Folder Permissions and ACLs’ (see the smaller of the two windows in the screenshot above, inside the red dotted line). Solution: either turn FileVault off, or put up with the behaviour. 2. If you are using an account with ‘Parental Controls’ enabled, the person who set up your account may have denied you permission to delete, modify or move some or all files. If 1 and 2, aren’t your problem, then you may have some permissions errors. — 2. What’s important here that the name after the series of ‘drwx’ letters is the same as your user name (my user name, as you can see, is ‘SnowLpd’). If it is, then ignore the rest of this post and go to the post Permissions Pt2. Where you replace your_username with (surprise…) your user name, which is also the name of your home folder (note there’s a space both before and after your_username). Thus, for example, if in the previous step it said ‘root’ instead of my username, then I’d type in ‘sudo chown -R SnowLpd .Trash’. —3. Now press ‘Return’. You will be prompted for your admin password. Type it in, but notice that you won’t see anything as you type, so type carefully. Hit ‘Return’ again. You should be returned to the Terminal prompt pretty quickly. Quit Terminal.app and see if your problems are solved. 4. If your .Trash permissions were OK, then you may need to fix either system permissions or ACL permissions. To do that, go to the next post.